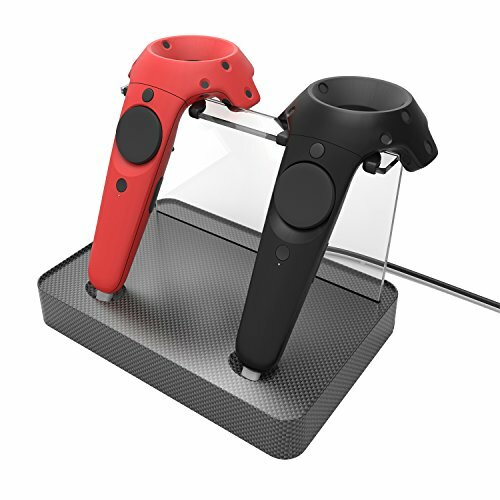 VIVE Controller Magnetic Charging Station is specially designed for controller storage, placing and charging. In the Controller of the charging interface increase the micro-USB magnets, to realize magnetic wireless charging and get rid of the wired charging way. When the VIVE player finishes the game, he just need to put the VIVE controller on the Charging Station , so it can keep the controller in full. Quickly and easily to process charging for each controller. Seamless link between the controllers, non influence for gaming time, no need to remove the USB connector all the time. 3.Before Remove the magnetic head, please read the instructions. ✓ StaSmart VR Magnetic Charging Station specially designed for HTC Vive and Vive Pro Controller storage,placing and charging. ✓ Magnetic micro-USB charging interface,to realize magnetic wireless charging and get rid of the wired charging way. It is in a cool and more convenient way,your friends will be impressed. ✓ Allows you to convenient charge the two HTC Vive and Vive pro controllers at the same time,always ready for the next adventure. ✓ Space saving,easy to install, help prevent the original micro port of the controllers,Built in Detachable Magnetic adapter, smoothly for daily fun. Strong adsorption, hold the vive controller steadily. ✓【Warranty】:We warrant this device 12 MONTHS from date of the original purchase for manufacturer defects. If the device fails due to a manufacturing defect, please contact seller directly to initiate return and warranty process. If you have any questions about this product by StaSmart, contact us by completing and submitting the form below. If you are looking for a specif part number, please include it with your message.